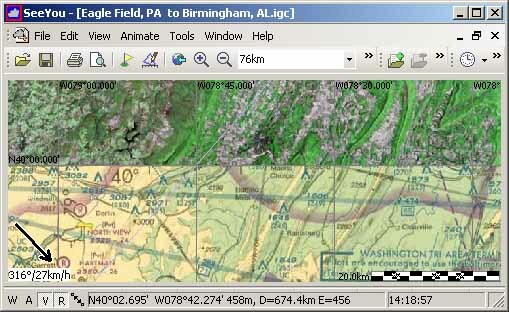 SeeYou software is a flight planning and analysis tool for glider, paraglider and hang glider pilots. It is designed for Windows PC as well as Android, iPhone and iPad devices. First purchase: If you're purchasing a SeeYou license for the first time then you'll need to choose either "Registration Key (1 Year)" or "Annual Subscription (Unlimited)". The "Registration Key (1 Year)" lasts for one year, after which you will have to renew manually (choose one of Upgrade/Renewal options). The "Annual Subscription (Unlimited)" option is a subscription service which means your licence will be renewed automatically each year. You can of course cancel your subscription at any time. Upgrade/Renewal: The "1 Year" option lasts for one year, after which you will have to renew manually. The "Unlimited" option is a subscription service which means your licence will be renewed automatically each year. You can of course cancel your subscription at any time. SeeYou functions before the flight allow you to plan tasks, manage waypoint lists and upload all that to the navigation device of your choice. After the flight it allows you to download flights from GPS devices, see your flight on the map, analyse it into the tiniest details through Statistics and 3D view. It is closely integrated with SeeYou Cloud in order to deliver seamless comfort in viewing your flights on home PC, at work, on your Tablet or Smartphone. * SeeYou is not a native Apple Mac application. To run it on a Mac you need to use Windows emulation software. We suggest you use Parallels (tested, works great! ), Cross Over, VMware Fusion or Bootcamp. Planning a badge or record flight? Look no further. SeeYou has an integrated Task Management tool which allows you to plan goal, Out-and-return, Triangle and other types of flights on a map. Trying to find out why others fly further or faster? Open all interesting flights on a single screen, animate the flights, study the routes flown by the best pilots and explore the statistics in every detail. This is how many aspiring pilots have become respected cross-country pilots and competitors. Airspace updates are automatic and free for SeeYou subscribers. It doesn't get easier than this. SeeYou checks for the latest airspace files automatically and notifies you about any updates. That's it - no installation, no downloads, fully automatic. SeeYou users don't install maps. They wait briefly for the maps to come to them. Open a flight and see how the maps will stream to your computer! Raster Maps, when compared to vector maps, are suitable for special use. For example when You want to explore features not covered in vector maps, such as vegetation, mountain top names, labels on maps and others. SeeYou uses a proprietary CMR raster format where images are geo-referenced and provide optimal resolution at various zoom levels. Extremely large maps like Satellite images and US Sectionals can be displayed at once without compromising speed. You may also scan Your own maps with the information You need. Combining vector and raster maps will give the best results in 3D! You will then be able to view Your flight in exactly the detail You need. SeeYou will give You much more detailed statistics for Your flight than any other gliding software. Are You interested in how good You are in thermalling to the left or right? Want to know the distribution of average lift or ground speeds used? How about those circles You make in vain, thinking "this must have been lift!" Ever thought about how much time they cost You? A great way to explore your flight is by studying flight phases. It is a very simple set of straight and circling phases of your flight. But it tells an interesting story when you start sorting these flight phases by clicking on column headers. Allow your imagination to guide you. Vector maps combined with satellite images. Height exaggeration: Multiplies terrain and track height. 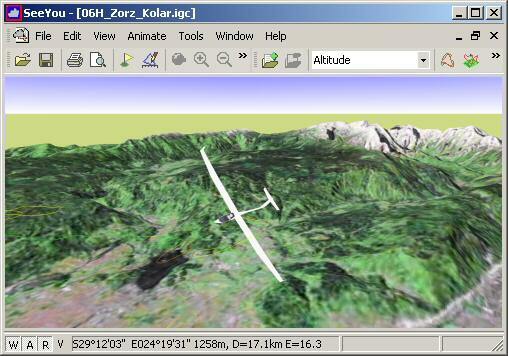 Flight Optimization is the phrase glider pilots most commonly use when talking about GPS flight recorders and computer software today. There is a growing number of XC contests which allow for undeclared flights and thus require some sort of optimization. Sophisticated mathematical algorithms enable SeeYou to calculate the longest task flown within seconds. You can copy the calculated task into Your flight and immediately enjoy a full statistics report for the optimized task. By pressing the Submit button in the Optimization panel you can submit your flights to the Online Contest with a single click. Optimizations include Free flight with up to 6 free waypoints, FAI Triangle, Triangle without FAI restrictions. For some, the optimized flight is compared to the declared task. Simultaneous animation of multiple flights is a very educational competition analysis. With SeeYou such animation is created by just a few clicks. Real time animation will show gliders' actual positions at a given time. Start Time synchronization is featured in the picture below. All gliders start the task at the same moment, so You can see who was the actual leader at a given moment. Take Off, Landing, Finish and Custom synchronizations are also possible. Each competitor can be presented with his flight parameters and own color. The length of the bar at each competition number represents the glider's altitude. From the Synchronize dialog you can choose the synchronization method. 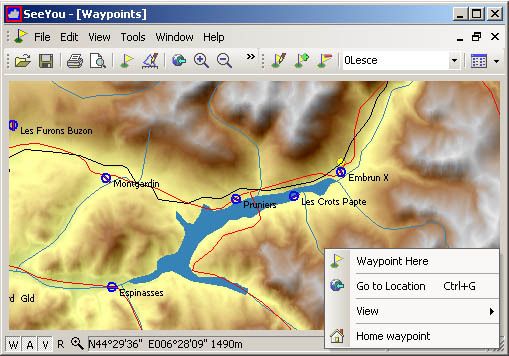 SeeYou presents several different types of waypoints, ranging from a turnpoint to mountain pass. Waypoints can be imported and exported to all file formats, known to us. If there is an unsupported file format, please let us know, and we will implement it as soon as possible. - The pop-up menu in the corner shows You how easy it is to manage waypoints. Home Waypoint is a useful feature for pilots who travel around the world with their gliders. This one-click menu offers You the possibility of switching between gliding sites anywhere in the world. All these and many other options can be set up through Page Setup window. A special feature even enables you to print Maps in desired scale. Since version 2.0 SeeYou is capable of communicating to a growing number of GPS devices. A simple connection wizard makes SeeYou an all-in-one application for your flying needs. SeeYou is used worldwide for scoring of competitions. Combined with Soaring Spot it becomes a fully features system able to score anything between your local club competition up to full scale World Championships. Using SeeYou Competition module is free. If you don't have access to a registered SeeYou copy request a free temporary key from Naviter, register your competition at Soaring Spot and read the comprehensive Manuals. Tools such as IGC Mail even enable you to do scoring remotely and completely automatically!